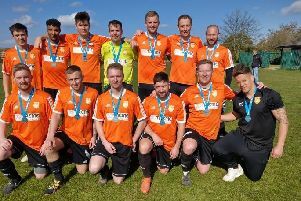 Prolific Peterborough Sunday Morning League marksman Luke Penman was the matchwinner as Cardea won the Hunts Sunday Cup at Chestnut Avenue this week (April 20). The Division Two side overcame Farcet United from Division Three 3-2 with Penman scoring two of their goals including the winner in the 69th minute. Penman opened the scoring in the 17th minute and an own goal put Cardea 2-0 up. But Farcet fought back to level it up before Penman settled the issue with his 24th goal of the season. Dan Beeken and Sam Cross were the Farcet goalscorers. Cardea FC (3-5-2): Gav Sampson; Gavin Earl, Michael Williams, Stuart Yaxley; Kynan Bereznyckyj, Alex Goymour, Aaron Yeoman, John Reddell, Shane Cooke; Luke Penman, Rob Ames. Subs: Daryn Whiteman, Aiden Stanford, Adam Simons.